Director: Jeff Malmberg. Documentary about a recovering trauma victim in upstate New York who builds and narrativizes a populated scale model of an entire Belgian town in his backyard, as a sort of self-appointed therapy project. Interview subjects include Mark Hogancamp, Edda Hogancamp, Emmanuel Nneji, Colleen Vargo, David Naugle, Bert Bodie, Tom Neubauer, Julie Swarthout, Lisa Bruck, Ruthie Hotaling, and Tod Lippy. Twitter Capsule: (2011) Kingston, NY, is the new Synecdoche! Hogancamp's art fascinates, but film stays benignly dumbfounded, delving too little. Second Capsule: (2019) Compassionate, startling, quirky without being twee. I have questions about rhythm and structure but I really admire it. VOR: ④ Might have played a bit more with form, but manages to be sober and colorful at once. A model of what we might call human-interest documentary. I don't want to rag too hard on Stonewall Uprising, but you didn't have to look far in 2010 for attractive alternatives to that movie's determined pursuit of boilerplate documentary tropes. The playfully rogue Exit Through the Gift Shop is an obvious counter-example, but even less maverick undertakings than that one prove how pliable nonfiction filmmaking can be, while still doing detailed, expository work and respecting the integrity of their subjects. 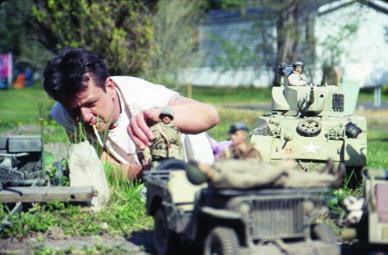 A worthy case in point is Marwencol, Jeff Malmberg's indelible profile of Mark Hogancamp, a victim of head trauma in upstate New York who, in the years following his violent crisis, constructs an entire model of a WW2-era "Belgian" village in his backyard. Hogancamp's story has returned to the spotlight (indeed, a much bigger spotlight than it ever had) amidst the current release of Universal's mass-market, Zemeckis-directed extrapolation of his story. That movie, Welcome to Marwen, has elicited a cold shoulder from most critics and an even colder one from audiences, though thoughtful defenses from critics I admire have me wondering if I need to catch it after all. What's clear from all commentary and even from the trailer is that Welcome to Marwen saw Hogancamp's story as a chance to explore cinematic capacities for fantasy-projection and complex explorations of first-person perspective, including cutting-edge effects work. Marwencol mostly declines all of that, and includes enough straight-to-camera testimony from Hogancamp himself and from a growing list of personal and professional acquaintances that it may owe a greater debt to standard, talking-head documentary modes than I've so far implied. That said, Marwencol models how a film can get close to its subject through simple but eloquent choices around camera, lighting, and editing, angles from which documentaries are too rarely reviewed by content-focused critics and audiences, and options that sometimes fly out the window when big studios subsidize the possibility of more grandiose approaches. Once you see Marwencol, you can't forget the person or the titular, doll-populated city that it's about. But what linger just as much for me are the movie's tact and its timbre. It offers plenty of reasons for us to view Hogancamp's project as a form of self-administered, post-traumatic recovery work, without using medicalizing language in a reductive way or diminishing the project's freestanding claims as art. By a similar token, while Marwencol cannot help but see how the elaborate narrative Hogancamp spins around his town involves a romanticized, displaced venue for processing his own suffering, filmmaker Jeff Malmberg is just as interested in the fundamental, fetishistic weirdness of Marwencol, which is so much more than an allegory or mirror for Hogancamp's own ordeals. If you're new to this story, the town and its epic tale center around "Hogie," a downed American fighter-pilot, hale but wounded, and a resistance army of female neighbors who combat the fascist armies encroaching on their village. Among these plot-strands of politics and righteous action, Hogancamp interweaves a series of romantic rapports and ruptures among Hogie, his blatant alter ego, and the various women surrounding, nursing, protecting, and succoring him. The most peculiar of these women is a blue-haired Belgian witch named Deja Thoris, but all of them have complex backstories and and are subject to wild story turns. Your Dungeons & Dragons cohort could never compete. Marwencol is as interested in Hogancamp's febrile, unpredictable imaginationespecially coming from a man whose personal affect is so laconic and frankas it is in the facts of his case, including the profound memory loss that, for better and worse, denies Hogancamp any access to the horrifying assault or to most of his previous life. It's a tall order to make a film about a man whose inner life is both excessive and sharply curtailed, and whose artmaking practice both is and isn't autobiographical, and who seems simultaneously eager and reluctant to open up about his biography or his passion-turned-vocation. Malmberg, who stays firmly behind the camera, choreographs different aspects of his filmmaking to preserve these tricky balances. The photography of Marwencol takes great care to shoot the figures from intimate distances and from literally on-the-ground angles, approximating not just Hogancamp's practical vantage as he lies on his belly, assembling, tweaking, and photographing its inhabitants, but evoking the intense thrall his figures exert over him. Malmberg, who serves as one of the film's quartet of cinematographers, has ensured that his lighting and framing approximate what we see in Hogancamp's own still photos of his village. This kind of craftsmanship surely requires a great deal of effort and indicates a deep fund of empathy for Hogancamp, but is all too easy to take for granted. Meanwhile, the editing and story-construction of Marwencol work differently. They have not been arranged to suggest that the filmmakers see "deeper" into Hogancamp or his enterprise as their work continues. We cannot tell if Marwencol is in any way making Hogancamp "better," or if such a prospect is possible, or even the right question. Nobody onscreen seems preoccupied with some fantasy of "fixing" this man, though nobody envies the hardships he has sustained. At heart, the film avoids imposing on Mark any salvific expectation, or any audience-baiting trajectory of healing, or even of change. If that means Marwencol often reflects a reiterative structure, rather than one defined by motion and progress, so be it. This whole story is so layered that we still feel like we're learning plenty as Marwencol unfolds. Our sense of Hogancamp himself gets more complicated, and we glean more perspectives of the people closest to Hogancamp, who are at once awestruck and perplexed by his activities. Do I occasionally feel that Marwencol repeats itself? Yes, especially as it tracks the loops and swerves of Hogancamp's own storytelling, which has vivid, eyebrow-raising moments but cannot feel as dynamic to the outside listener as it must to him. I'm sure you've heard people relate their dreams, and though the Epic of Marwencol is a really, really good dreamyou know what I mean. I also wonder if Malmberg seizes as many opportunities as he might to press Hogancamp on some details regarding himself or about Marwencol or, if such direct pressing is practically or ethically impossible, to probe some complexities that surround it. We meet at least one woman, Colleen, who is kind and supportive of Mark's work and his predicament but a bit startled to learn how fully his crush on her has become a narrative and emotional crux of his world-building. Maybe we don't need to know more about this than we do, from Mark or from Colleen or from her offscreen husband, alleged to be rather alarmed. Malmberg certainly conveys plenty in this direction, as he does about the artist's hard-drinking past, and about the pronounced tilt toward sadomasochistic ecstasy in Hogie's tableaus of suffering, and about Hogancamp's nerves regarding his "discovery" by New York City gallery curators. Not every stone needs exhaustive overturning for us to gather that Hogancamp's case is complicated in innumerable respects, and here, too, I appreciate the film's discretion. Still, I sometimes worry over the boundary between being tactful and being vague, or letting the strange, tantalizing facts and images speak for themselves, sans much creative and interrogative intervention. Those misgivings, which I don't want to overstateI really like Marwencol!reach their greatest pitch but also flip in a nearly-opposite direction in the final third of the movie. Only here does Malmberg start exploring Hogancamp's complex relations to gender and self-presentation, including his passion for high-heeled shoes, of which he owns 218 pairs. He ardently wears them around the house but is not yet ready to sport them outsideor maybe he is, or maybe he's at least conversationally open about it. We do, after all, learn that Hogancamp's enthusiasm for women's clothes and local perceptions of him as a cross-dresser motivated the attack that cost him so dearly, and nearly cost him everything. How did these assailants find out? There's something pleasing about Marwencol's self-consciously delayed disclosure of this thread, which gets steadily more foregrounded, culminating in a will-he-or-won't-he question about whether Hogancamp will sport heels at his first exhibition in the Big Apple. It's exciting to see Mark claim this part of his desires, and at least as exciting to realize (again) that you can spend 50 minutes learning so much about someone and still have major revelations awaiting you, arguably hidden in plain sight. But I do also chafe a bit at how Marwencol constructs this turn in the narrative as a plot twist, and commits fairly ardently to its "You go, Hogie!" enthusiasm for Hogancamp's baby steps in stilettos. The movie's tone in these passages seems less complex than it has previously, its managing of information for the sake of drama a bit less honest, especially given the centrality of these questions to every aspect of Hogancamp's story. There's a funny laugh moment when Hogancamp confesses, following his gallery premiere, that he failed to take a single photo of how his own pictures of Marwencol were displayed or of the bounteous admirers he has attracted overnight, whereas he snapped countless shots of the female patrons' shoes. It's not quite fair, but not not fair, to say Malmberg's own attentions feel comparably redirected. His movie inclinesnot all the way, but pretty fartoward an It Gets Better epistemology as Hogancamp finally lets his femme flag fly. This kind of naïve, audience-friendly optimism is what Marwencol admirably suppressed in relation to Mark's aesthetic practices and narrative fixations, warts and all. Whether Hogancamp really will be happier or safer in Kingston now that the shoes, at least, are out of the closet is another question Marwencol is brave enough to raise but not really to explore. That's not to consign Mark's community to stereotypes of smalltown intolerance, which circulate too freely and uncritically in U.S. culture and are heavily belied by a great deal of fond testimony in Marwencol. Nonetheless, misogyny and homophobia are entrenched enough in Kingston, as they are everywhere, to have carried Mark Hogancamp to the brink of death. They could again, even as he's an eccentric, category-resistant object for those particular bigotries. It's easy for New York gallery workers to applaud Mark's claiming of his authentic self (which is how they seem to perceive his tentative stabs at confounding normative gender), just as it's easy for them to insist that of course the world of commodified art and its attendant forms of publicity won't compromise the singular, semi-private enterprise that has kept Mark going this long, against stark odds. Malmberg seems wary on the latter score in a way he isn't on the former, without quite explaining why. Both times I've watched the film, I have felt newly and gratefully conscious of just how complex individual lives can be, despite all of our temptations to dogmatize or generalize, even when we think we aren't doing so. Artistic subtlety as well as human decency inform Malmberg's approach to this chronicle, both of which I appreciate in the extreme. I also leave feeling disappointed, though, that Marwencol picks up a broader brush by its finish, having spent so much time sharing and honoring its subject's affinity for meticulous, curious, fine-grained perception.